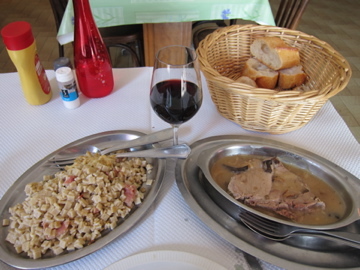 The menu has four choices that boil down to one: roast pork with mushroom sauce with a huge side of crozets de savoie, a buckwheat pasta dish. Your real choice is just how many extra courses. I pay 13 Euros ($14.50) to have it with salad, cheese, dessert, coffee and mineral water. I could have 250ml of house red instead of the coffee and mineral water, but I splurge 7 Euros on a glass of Côte-Rôtie, with no knowledge of the producer. The salad is lettuce leaves bathed in a vinegary dressing with a hard boiled egg and croutons. It's after 1 p.m. and I had a stale brioche for breakfast, so I devour it. But even hungry, I am no match for the pork and pasta. The pork is tender, the mushroom sauce creamy, but the crozets de savoie, while interesting looking and fortified with chunks of ham, is bland. I end up dumping all of my mushroom sauce on it and adding pepper and salt. It's workman's food, hearty and satisfying, and the anonymous Côte-Rôtie is spicy and elegant. I'm stunned by the generous, downmarket cheese plate: four choices I can't identify, so I have some of each, and the waitress favors me with a smile for my greediness. The creamy, mild blue cheese is particularly good. The dessert, cherry tart, has only mild sweetness. Coffee is a tiny cup of burned-bean espresso, a potent, bitter, wake-up. I peek in the kitchen and it's large, clean and serious, with three stoves, all completely cleaned up by the time I, the last diner, am done eating at 1:45 p.m. 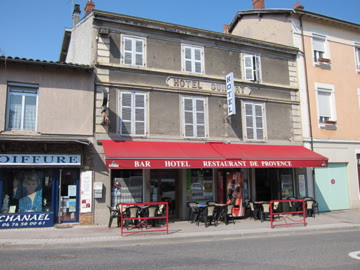 If you haven't eaten lunch by now in rural France, you're out of luck. The chef, a stout man with a gray crewcut, wears a white rugby t-shirt, bold for a cook, but it's unstained. 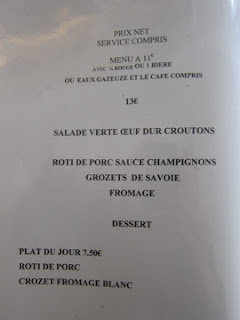 This isn't the best meal I've had in France; it isn't even the best meal I had that week. But it fulfilled the dream of a rural roadside set lunch: reasonably priced, satisfying, with an honest working man's feel. 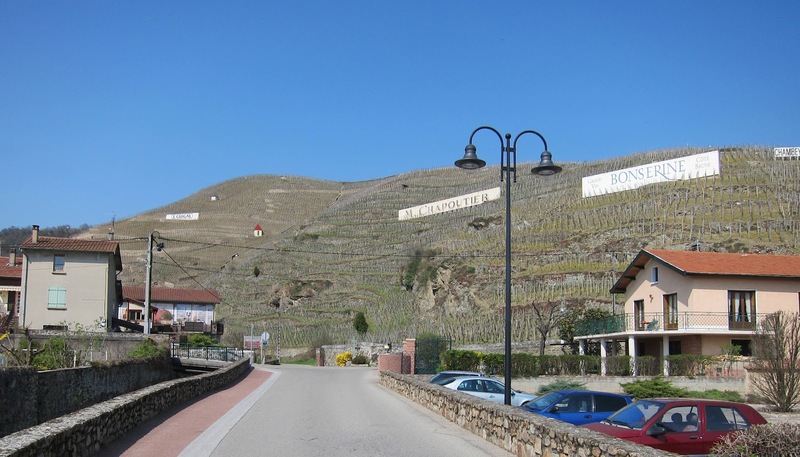 My column this month for Palate Press is about a discovery I made when I went to see Côte-Rôtie: a little unused slice of land across the river, praised by Pliny the Elder, that turns out to have the same terroir as Côte-Rôtie. Please go read it, because I think it's a good story; those vineyards are special, whereas this lunch was an everyday simple pleasure. Both have their place.